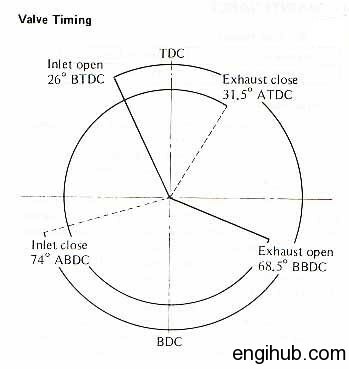 The performance of engine depends on valve timing, mean effective pressure and rotational speed. Mean effective pressure is limited by fuel and strength of materials. The only way to have higher performance is to have higher rotational speed. In high-performance engines, it is usual to open the valves earlier and close them later. So that the opening time is more thus ensuring the maximum amount of fresh mixture at higher rotational engine speed. This also ensures the greatest possible clearance of exhaust gases. In some un-supercharged racing cars, inlet valve opens as early as 25 degrees before the top dead center. It closes 60 degrees after the bottom dead center. Exhaust valve opens 55 before bottom dead center and closes 25 degrees after the top dead center. 01) Inlet valve opens 10 to 30 degree in advance of top dead center position. Closes 30 to 60 degree after the bottom dead center. 02) Exhaust valve opens 30 to 60 degree in advance of the bottom dead center position. Closes 8 to 25 degree after the top dead center position. It has been found practically that the actual maximum pressure in such engine is only about half of the theoretical value. Because the inlet and outlet valves do not open and close suddenly but take some time to operate. Because of the resistance of the inlet valve of the entering charge, the actual pressure inside the cylinder during the suction stroke is slightly less than atmospheric pressure. 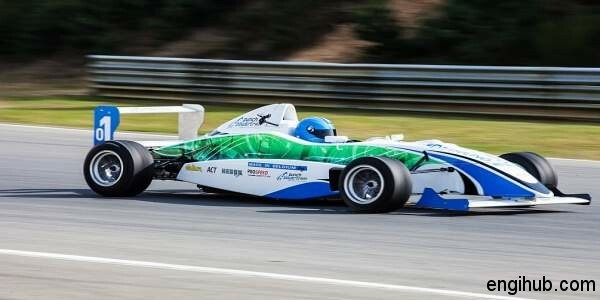 Similarly, because of the resistance of exhaust valve to exhaust gases leaving the cylinder, the actual pressure inside the cylinder during exhaust stroke is slightly higher than atmospheric pressure. Due to this, there are some losses occur which is called as “Pumping Loss”. This loss is treated as negative. Hence, subtracted from the positive work done, thus we get network done during the cycle.